Iarnród Éireann chairman Frank Allen has said he hopes to be able find a way to resolve the current dispute at the company and avoid disruption to the travelling public. 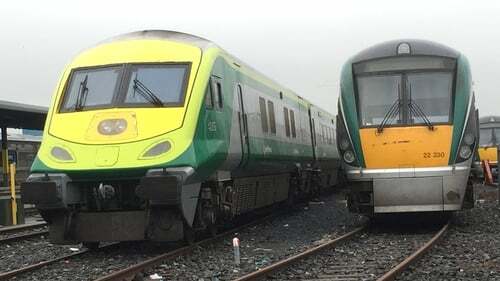 Thousands of rail passengers face significant disruption in the run-up to Christmas after unions at Iarnród Éireann announced five 24-hour strikes in their dispute over pay. SIPTU, Unite, and National Bus and Rail Union members at Iarnród Éireann have voted overwhelmingly in favour of industrial action in a dispute over pay and will hold stoppages on 1, 7, 14, and 23 November, and 8 December. Appearing before the Oireachtas Joint Committee on Transport, Tourism and Sport, Mr Allen said he still hoped to engage with staff through the Workplace Relations Commission and the Labour Court to find a way to respond to workers' expectations of a salary increase, recognising the financial circumstances of the company. "I think there is a way to do that. I hope we can get there and avoid unnecessary disruption the travelling public," Mr Allen said. He said management put forward proposals to the WRC for salary increases last week, but in the context of organisational change that took account of the company's straightened financial circumstances. He also warned about the impact of an under-investment in maintenance during the recession, saying that €103m needed to be spent for five years to catch up with deferred maintenance. Iarnód Éireann, Dublin Bus and Bus Éireann representatives are before the committee today. Mr Allen rejected a suggestion that the CEO intervened negatively in the negotiations between management and unions at the WRC. Responding to Fianna Fáil's transport spokesman Robert Troy, Mr Allen said he would expect the chief executive to be actively participating in critical negotiations and ensuring proposals are being put on the table, and that they are costed. "If the chief executive was not actively supporting and participating in critical negotiations and discussions and making sure that every possible avenue was being explored, if he was not doing that, I'm not sure what he would have been doing," Mr Allen told the committee. He said he did not accept that there was a strike proposed because the chief executive intervened negatively. Mr Allen, meanwhile, defended the company spending €20,000 on a corporate angling event in Northern Ireland attended by senior executives at the company. Mr Troy said correspondence about the event had been received anonymously by Committee members. Mr Allen said he did not know the event was taking place, but defended the participation in an event which gave the opportunity to network with other European railways. "The idea that Iarnród Éireann participates in professional networks where people within our railway engage with and get to know and learn from experiences in railways across Europe, is a good thing. And sometimes that involves more informal, social activities," Mr Allen said. Mr Troy said the company had to defer maintenance of its tracks because of limited resources and he would have preferred to hear Mr Allen say he did not think the event was value for money.